Butter Dish For Kerrygold Butter? I have a confession to make… I LOVE BUTTER! 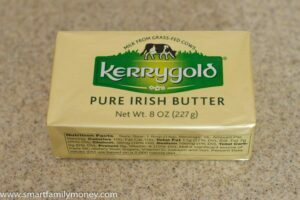 Other butter lovers out there are probably familiar with the famous Kerrygold butter. Now that I’m a Costco member, I can buy three 8 oz sticks of Kerrygold for only a bit more than one stick costs in the grocery store! 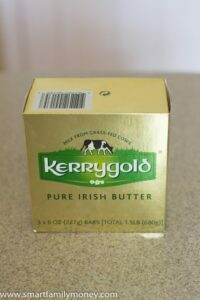 If you know about Kerrygold butter, you probably also know that it’s a bit of a challenge to store. 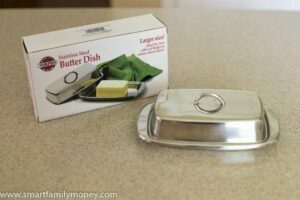 I finally got fed up and searched for a butter dish for Kerrygold butter. 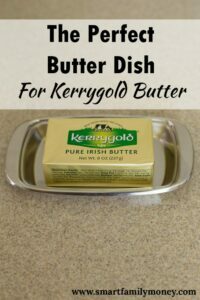 If you’re a Kerrygold butter lover too, read on! Kerrygold butter sticks are twice the size of American sticks of butter. 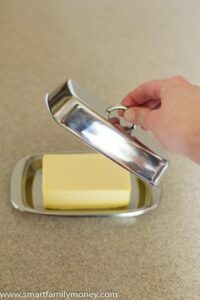 Kerrygold sticks of butter do not fit in American butter dishes. The only downside I found is that it does show fingerprints, but that’s to be expected from stainless steel. It’s also thinner/lighter than I expected, but that’s not really a problem. Finally! 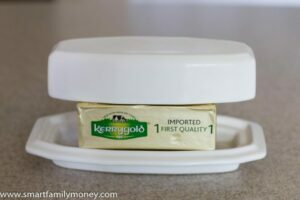 I found a place to store my precious Kerrygold Butter! Do you have friends who love Kerrygold butter? Share this post with your favorite butter-lover! Fascinating cultural difference… I’ve never seen a butter dish that doesnt fit kerrygold butter but I’m in the UK! Glad you’ve found a way to enjoy delicious kerrygold butter ?